PPFAS Long Term Value Fund and the scheme has gathered a corpus of Rs500 crore, with around 2,900 unit holders, which is higher than almost 60% of the equity diversified mutual fund schemes in existence. In my view it is a good fund. It is trying to position itself a different fund. Look at the Quantum Mutual fund. Its expense ratio is very low. It was criticized by everyone in the beginning and now everyone is recommending this fund. Today, everyone talk about HDFC MF, ICICI Prudential MF and Birla MF. But nobody knows that these are not well performing in the beginning. They have several schemes and only few schemes performs. HDFC Top 200, HDFC Equity and HDFC Prudence are not HDFC Fund. They were Zurich India MF and ITC Threadneedle MF in late nineties. Prashant Jain was not fund manager of HDFC TOp 200 since beginging some foreigner was. Similarly, Birla Frontline Equity is the fund managed by Alliance Capital with its star fund manager Sameer Arora. ICICI Prudential had very bad past and it was known for unethical practices. Now some of these funds are doing well. What I am trying to say is we should give time to a fund. Stocks are selected by Fund Manager based on his/her skill. We are not fund manager who can dictate the fund manager to choose the stocks. Anyway most of the funds have similar stocks as they choose NIFY 50 or BSE 30 stocks. They will get similar returns. Unless someone tries to do things differently, result will not change. Again, there is no guarantee of success as stock markets are unpredictable and no fund manager including MONEYLIFE can predict about future. People can give comments, inputs, views, etc. It is easy to post mortem than to create a new thing. If moneylife is always correct, then all other financial planners and different website will close their business. In my limited knowledge stock market works on different perceptions of market players and not same. If dividends are unethical . . . then redeeming units must be a sin. I think that we should treat this Fund as Bank FD ...but with higher yield and no long term capital gain tax. This fund will give decent returns and safety of capital..and hedge against inflation which most Indians crave. I dont understand why so much hype for this fund. Not impressed with the portfolio quality. Look at this 4 year old video https://http://www.youtube.com/watch?v=CTIMDQy3EFg where they talk about noida toll, IL&FS, mphasis etc. Now they have given -ve returns even after 4 years. If 4 year not long term, then what is?. I hate to talk about price performance. But the price has followed earnings here. Value investing is not about buying low p/e stocks. The "hype" is about the approach to investors in a world where financial consumers are regularly taken for a ride. The hype is not about the best performance. We agree with your about the portfolio. As we have mentioned in the article: "Many stocks are not the best in their class and hence are valued available cheap. Returns from them are unlikely to be high, especially since these stocks have not been able to prove themselves over multiple business and market cycles. " Im sure moneylife mutual fund stocks published in their magazine leaves all mutual funds streets behind. 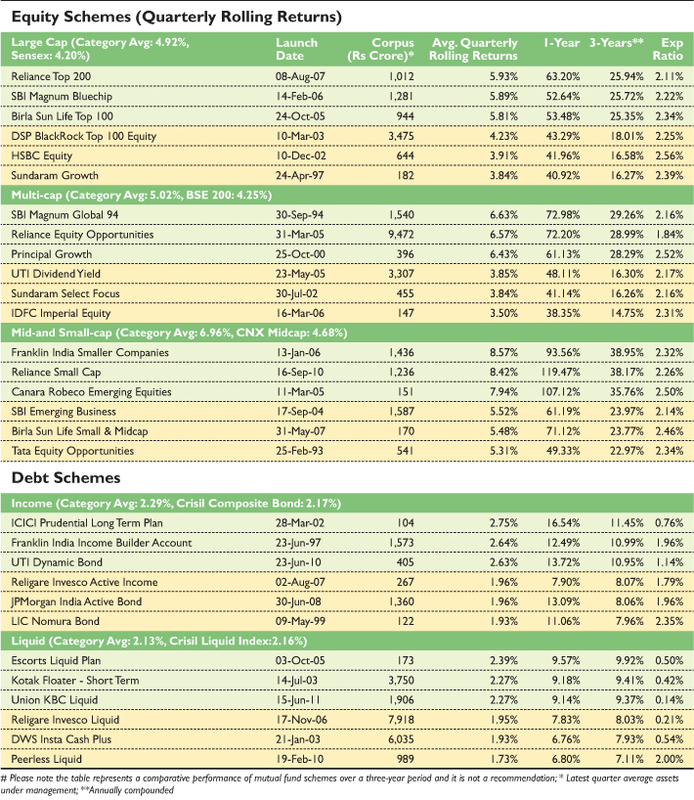 Birla Sun Life Equity Savings Fund: An alternative to MIPs? Birla Sun Life Equity Savings Fund has an investment strategy similar to Monthly Income Plans (MIPs). Should you invest? Arbitrage schemes are not as risky as equity-diversified schemes since they take advantage of mispricing in the spot and derivative market of equities. In other words, they do not take straight exposure to equity. The returns on these schemes are in line with those of liquid schemes and, therefore, they are considered an alternative to low-risk liquid schemes. These schemes turned attractive after the Budget 2014, which modified the capital gains taxation norms for non-equity schemes—including debt schemes and liquid schemes—stripping away their tax advantage. Monthly Income Plans (MIPs) which invest a less than 65% in equities were adversely affected after the change in tax norms. Not to say they were any good earlier. The fund houses have come up with an alternative: ‘Equity Savings Funds’. These take a hedged exposure (for arbitrage opportunities up to a maximum of 60%-75% of the portfolio) and will invest 20%-50% in stocks. Birla Sun Life Equity Savings Fund and open ended equity scheme, follows the same concept. The scheme will invest over 65% of its portfolio in equities. Of which, a part of the portfolio will be managed using the arbitrage strategy (20%-60%) by taking advantage from the price differentials / mis-pricing prevailing for stock / index in various market segments. Net long equity exposure will range between 20% and 45%. These schemes are neither here nor there. They do not add any value to your portfolio.